Posted by Briana Hammontree on January 27, 2019 in Lifestyles. 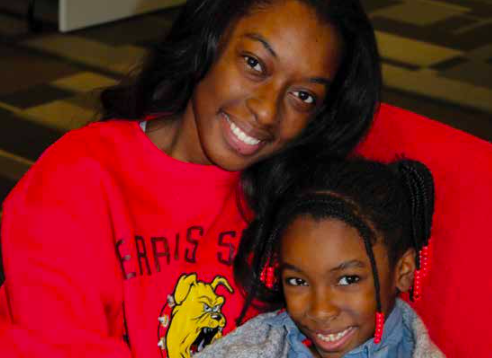 With a goal of setting a positive example for her daughter, Ferris actuarial science senior Anzhane Lance creates events that cater to other students with children while forming connections and making friends. Lance is president of the Student Parent Association (SPA), a Ferris registered student organization. “We’re basically an organization that focuses on creating events on campus that are family-friendly, so everybody feels welcome,” Lance said. First established in 2011, SPA often works with other organizations on campus such as the Center for Leadership, Activities and Career Services office, Students with Children Program and the Veterans Association. Being a part of SPA, Lance is able to be a role model for her daughter Raejane Williams. “She is my only child and she’s six. She’s at an age where she’s growing her own personality and it’s really cool to see. We love having concerts, so we get dressed in full costume and sing our favorite songs. We also like watching TV together because she likes family sitcoms and I like cartoons,” Lance said. Ferris political science senior Trishia Blackwell is vice president of SPA and has grown closer to Lance as their daughters spend time together. “I think she’s wonderful. She’s a very strong and good example of a woman. She’s a good example to women and mothers that you can be successful. She’s on top of getting things done, keeping us organized and she’s very smart too. She’s very put together, I guess you could say,” Blackwell said. Aside from her time within SPA, Lance is also vice president of national leadership society Omicron Delta Kappa, a member of national mathematics honors society Pi Mu Epsilon and a member of professional fraternity Gamma Iota Sigma. As part of various organizations, she believes her skills as a mother and involved student allow her to develop further as an individual, but understands that her experiences vary to other students who are not parents. “It is very different, like night and day, because there are so many other things you have to think about. Like when I’m going to class, work, that kind of stuff, that I have to think about where my kid is and whether she’s in a safe environment, does she need anything,” Lance said. Ferris Director of Students with Children Karen GreenBay agrees that a student parent’s college experience can be different from students without children. “Student parents not only make day-to-day scheduling for themselves, but also for their children and family. They juggle things around child care, school for the kids, sports for the kids, homework time for both the student and their children, dinner time and much more,” GreenBay said. Despite having a different college experience than other students, Lance discovered her experience within SPA and being a mother to be rewarding.